UNLESS YOU’RE A LOCAL or a native, you likely bypass the small towns which sit off county roads, tucked away from trafficked highways that take time-pressed travelers from destination to destination. 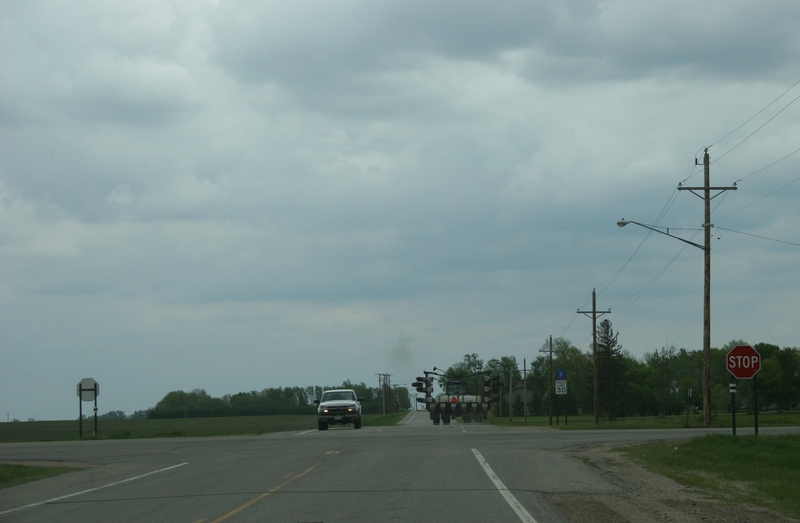 Nearing Delhi at the intersections of Redwood County Road 9 and 6. 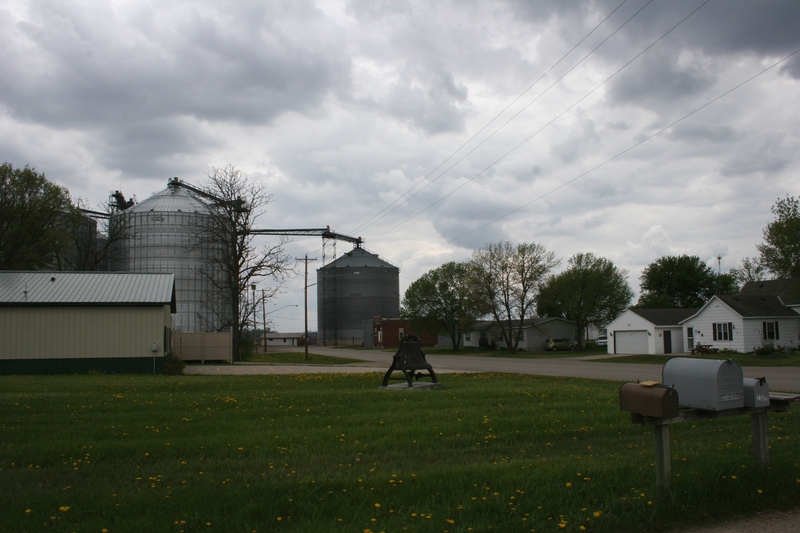 On a recent trip back to my native southwestern Minnesota prairie, my husband and I sidetracked off our usual route along State Highway 19 between Belview and Redwood Falls to follow Redwood County Road 9 to Delhi. Decades have passed since I visited Delhi, at the intersection of county roads 9 and 6. A sweet, well-cared for home in Delhi. Most would surmise there’s not much in Delhi. That is until you look and consider that some 70 folks call this rural farming community home. 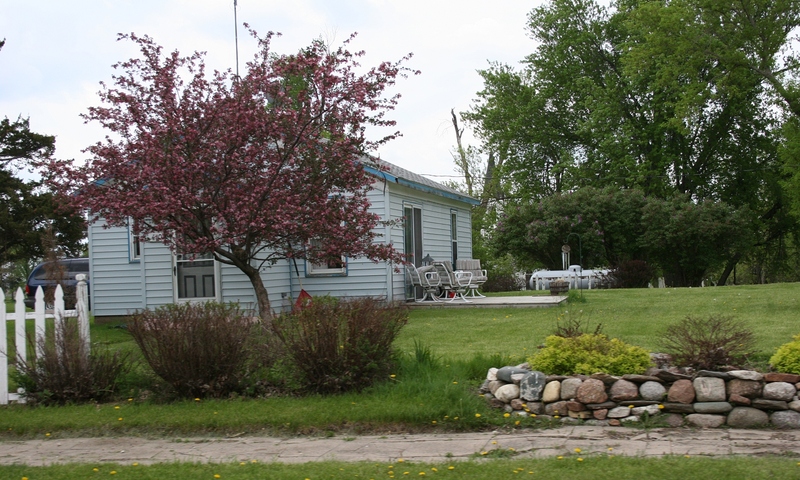 Another cute home with lovely landscaping that includes field rocks. In need of a little TLC, both home and car. While some residents care about their properties with well-tended houses, others show less interest in maintenance. That is not uncommon in small towns. Or perhaps such neglect is more noticeable with fewer houses. 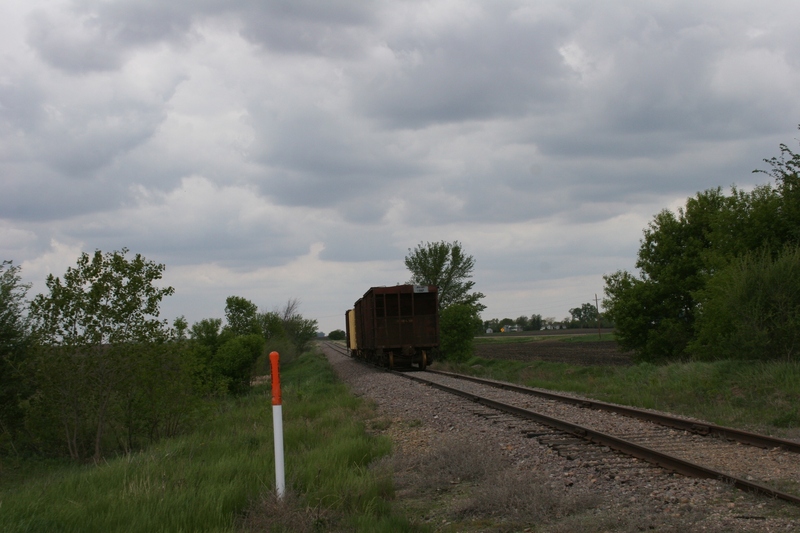 Parked along the tracks just off Redwood County Road 6 west of Delhi. 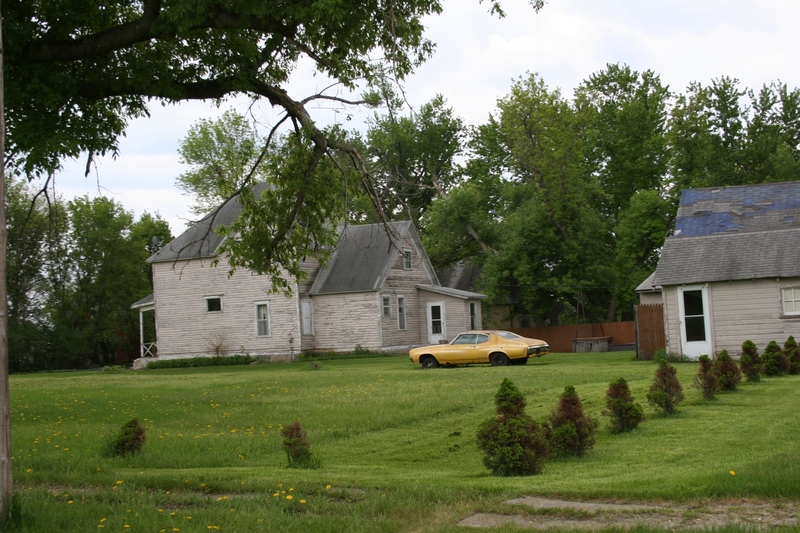 Like so many small towns along the railroad line, this settlement once boomed. Information published in The History of Redwood County, Volume 1, states that Delhi was platted in 1884, shortly after the railroad came through the area. Alfred M. Cook, a builder and owner of a flour mill in neighboring Redwood Falls, named Delhi, according to Minnesota place name info on the Minnesota Historical Society website. He came to the area from Delhi, Ohio. 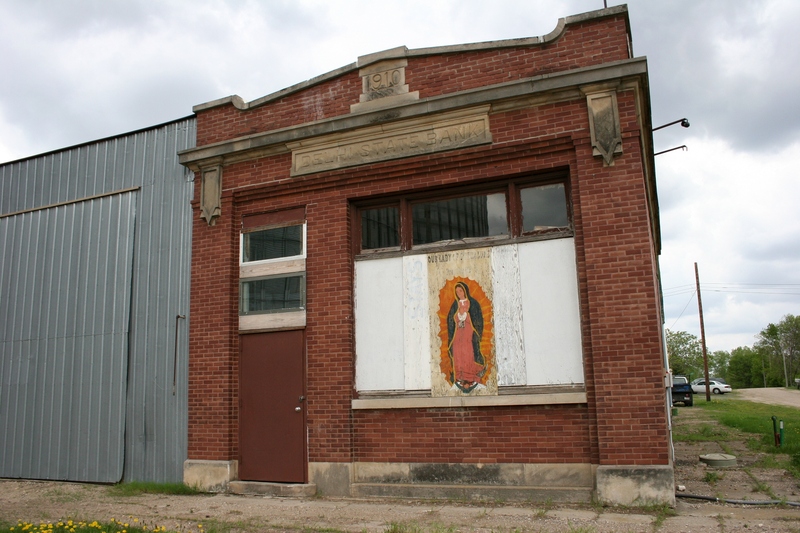 The front window of the 1910 Delhi State Bank is now mostly boarded with a painting of Our Lady of Guadalupe. The Delhi State Bank, built of brick in 1910, and now abandoned and apparently last used as a church, shows me that folks once believed in this place. Not that they don’t anymore. But like all too many prairie communities, Delhi has mostly withered away. 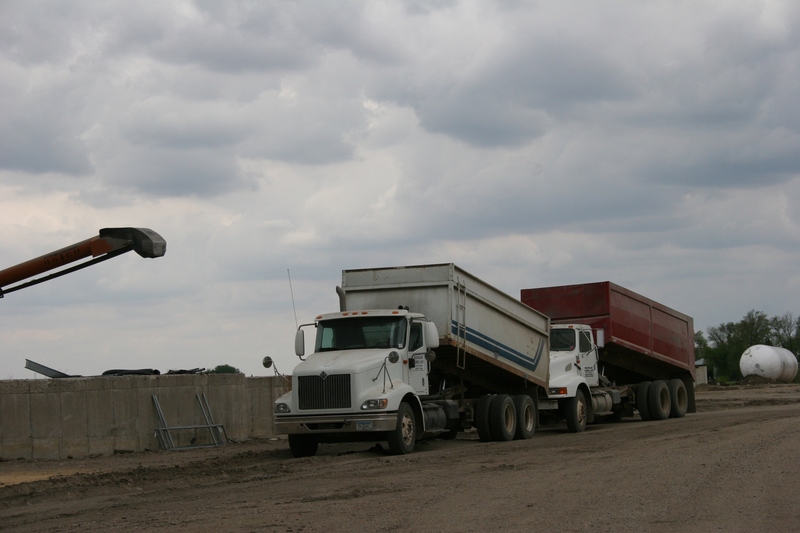 Grain trucks parked near the grain bins. 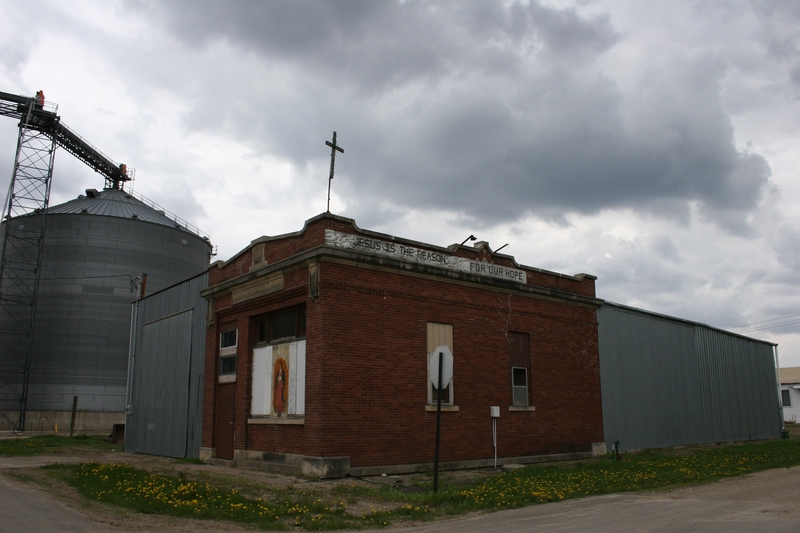 Many other businesses once operated here, but they are no more, with the noticeable exception of a grain business. Delhi, in the late 1800s, housed general, drug, hardware and lumber stores, a hotel, a railroad and telegraph agent, a feed mill, a blacksmith shop, a farm implement business and more. What a lovely church this must be (or once was) inside as evidenced from the exterior. The Presbyterian church today appears shuttered. Evidence of faith in former bank and bin. Despite all of this and the inclination to despair, I cannot help but admire the determination of Delhi to cling to the land. Prairie roots run deep. Those little towns we drive through along the way that are only wide spots in the road are full of memories for many. It always makes me wonder what the stories are and who is still left to carry on the town’s name. Good point, that full of memories. Your observations are similar to mine as we come across these small treasures dotting the countryside. What was it like to live there when the hustle and bustle of business occupied the main street(s)? Children playing and clothes hung on lines stretched between trees. Sunday church meetings and picnics that followed. If only some of those field stones could whisper their stories!!!!! I like that–field stones whispering stories. My own hometown has changed so much since my youth. No more school. Nearly every business shuttered. It’s sad. It IS sad. There would be so many that would argue that those days belong in the past and “we’ve come so far” but, it seems, (in so many cases) we’ve lost ‘quality of life’ in favor of ‘quantity of stuff’ from which many derive their identity. In the process, inner peace and joy has taken a back seat or has been lost entirely. The “emptiness” of soul that pervades our society is at tragic levels. You would like it, C.
I don’t know the answer. But I’ve seen too many homes that are not kept up in small towns. Is it a matter of not caring, a matter of finances, a matter of??? 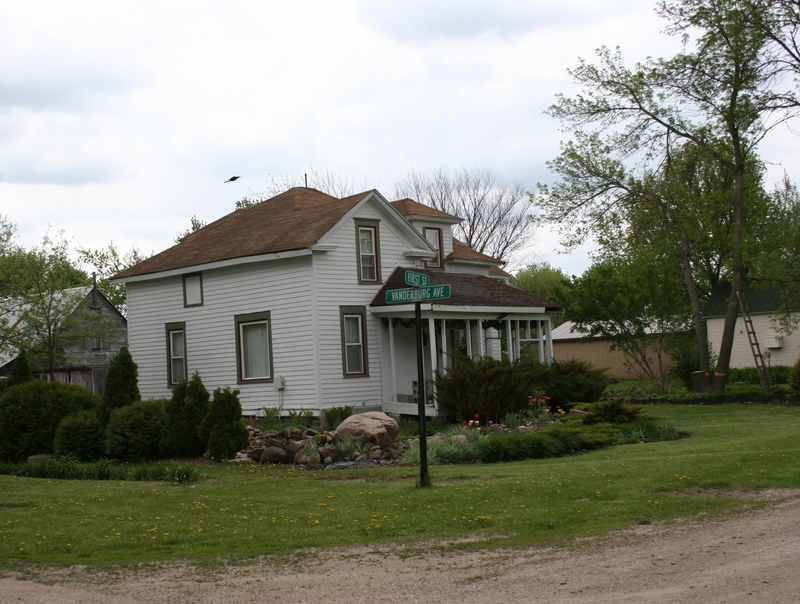 Great Share – love learning about places and the history of the place and the people – love your captures, especially the homes and bank 🙂 I have family that lives in the Redwood Falls area. Happy Hump Day! Well, the Redwood Falls area is where I am from, some 20 miles to the west. And I bet you could find a house very reasonably prices in such a place. Someday. Right? 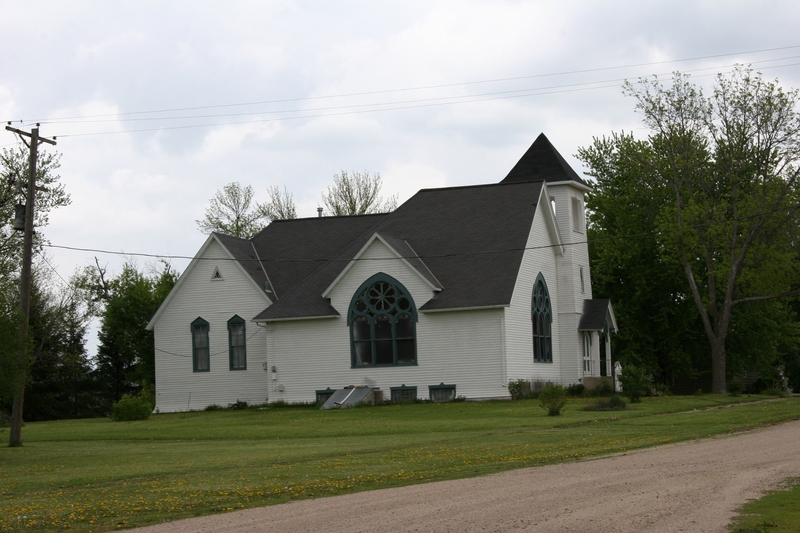 Thanks for highlighting Delhi, one of the towns in Little Minnesota: 100 Towns Around 100. At one time, Delhi had high hopes of prosperity and growth, but like most railroad towns, the population dwindled with the advent of cars and improved roads. With increased mobility, the opening of Big Box stores and societal changes, many towns like Delhi declined in population. I need only look at my hometown of Vesta to see the tremendous changes there from 40 years ago. Gone are the many businesses that once lined the one-block Main Street. Now everyone shops at regional hubs like Marshall, Willmar, Mankato, Redwood Falls, etc. I like how you love to explore those small towns, so much to see….if you’re really looking! I love the old brick state bank building and of course the church. I noticed the double doors below the big center window, perhaps it leads to a cellar. Reminds me of the old cellar doors my Grandma had on the old farm house…lots of yummy canned goods stored down there. No detail gets past you does it, Jackie? I noticed those cellar style doors at the church, too. You have the photographer’s eye. If only those walls of the buildings could talk! Just imagine the stories they’d tell….love driving through old towns. And there are probably a few old-timers around Delhi who could share a story or two also. i grew up in Delhi Minnesota. lived there between 1957 to 1962. (aged 6 to 11) it was great!! The school was for grades 1-6 and after that kids got bussed to Redwood Falls or Belview. Delhi’s “hay day” was 1890 when a gold mine was mined near the Minnesota river. it was the work in the gold mine that brought my step father’s granddad to Delhi. Being so close to the river meant the gold mine needed to have water pumped out constantly. when the value of the gold was less than the cost of pumping the mine was abandon and it filled with water and became our favourite swimming hole. It was very deep; and it was very clean spring water. Alice, thank you for commenting on this post and telling us more about Delhi and your personal connection. the school is gone. it was a big 2 story brick school house that had once served children aged 6-18. it was a lovely building with a music room, a library, and larger theatre (with proper dressing rooms) which we used for our Christmas programs. the science rooms with all the special equipment were no longer used when i was there. In the 50s there were just two teachers. class size varied between 1 person to a class with 9 people, which was my class (we are the baby boomers). We had an excellent education, we each of us worked at our own pace and were always challenged to do well. Many of us received great educations in small towns. You have some wonderful memories of school in Delhi. The best thing about living in Delhi was the freedom us kids enjoyed. and all the deserted older buildings like the blacksmith shop that was still standing in tact with all the equipment still in it it. we could explore all these old buildings and play our summers way. What fun. I wish kids today could experience the freedom we experienced as youth. I wish I could answer your question, Myranda, but I can’t.